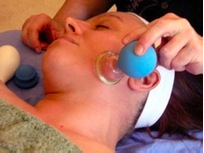 The ancient therapy of facial cupping has been used for centuries by women in Europe, Russia and Asia to rejuvenate and preserve their skin. It’s one of the secrets of the Geisha. The skillful use of small glass suction cups to gently lift facial tissue creates negative pressure...a natural facelift. A natural way to subtract years from your face without the side effects of chemical treatments or a surgical facelift. 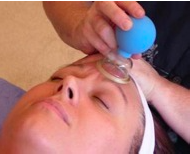 The Cupping Facial is completely painless and leaves no marks. As a general guideline, it’s recommended to schedule three consecutive weekly treatments, followed by four bi-monthly treatments. We can then evaluate how your face responds and maintains the treatment. The Cupping Facial is $125 for a one hour treatment.